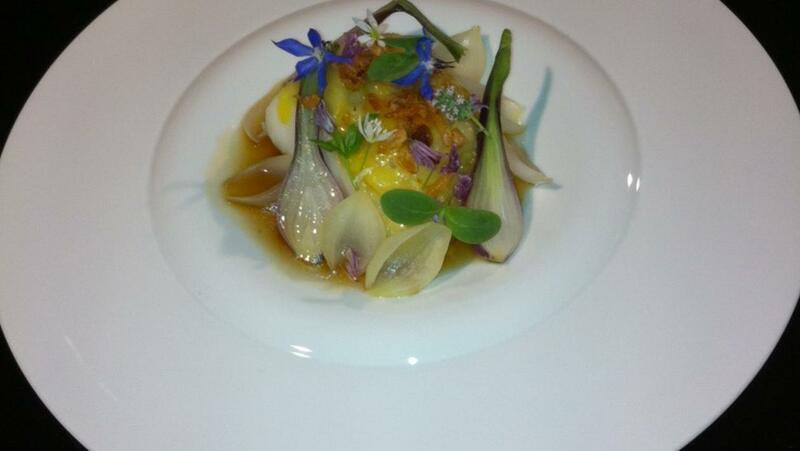 One of the National Young Chef of the Year finalists created this tasty dish. The Lyonnaise onions bring in some delicious taste to this fish recipe which is a great fish main course. Fry the onion flat in half in oil and soft brown sugar until dark in colour. Place in a deep tray and cover with 500ml of Chicken stock then leave in the oven for 8 hours at 60 degrees to allow for the maximum flavour. Finely slice one white onion using a Japanese mandolin. Place in a small saucepan with 25g of butter and 100ml chicken stock, season and add two sprigs of lemon thyme. Cover with cling film and allow to steam on a low heat until the onions are cooked but no colour. Cook the onions in 100ml of chicken stock for 6 min. then allow to cool slightly before slicing in half. Peel and slice the shallots then coat in flour and deep fry until golden and crispy. Drain on kitchen paper until needed. Sear both sides of the Pollock until light golden brown. Place in the oven for a further 3-4 min. until cooked. Begin to plate by coating the top of the Pollock with the Lyonnaise onions followed by the thin slice of Gruyere cheese then place the fish on to a serving a bowl, arrange the grelot onions around the edge and finish the top of the fish with the crispy shallots, edible flowers and herbs. Serve the onion consommé in a separate jug and pour when ready to eat.